WHY SHOULD I CONSIDER A MOVE TO BRAZOS TOWERS AT BAYOU MANOR? If you spend too much time at home alone and sometimes wish you had more friends? If house maintenance, lawn care, shopping and cooking are becoming burdensome tasks? If you want more time to pursue hobbies, travel, go to classes or stay in shape? Are you worried about where you or your spouse would be cared for if necessary? Do you want to be sure your children are not worrying about your future? If you answered ‘yes’ to any of the questions above, Brazos Towers at Bayou Manor maybe the place for you. A common theme among our residents is, they should have moved sooner to enjoy the freedom of living at this distinctive community. WHY IS A CONTINUING CARE COMMUNITY SO IMPORTANT? Continuing care means you will receive long-term health care services regardless of your needs without moving from Brazos Towers at Bayou Manor. With continuing care, you know where you would receive assisted living and nursing services, who would be caring for you, how much it will cost and how you would pay for it. With our comprehensive program of wellness activities, in-home services, rehabilitation therapy, assisted living, memory support and nursing care, you will get the level of care you require for as long as you need it. MY GOAL IS TO STAY ACTIVE AND HEALTHY LONGER, HOW CAN YOU HELP? 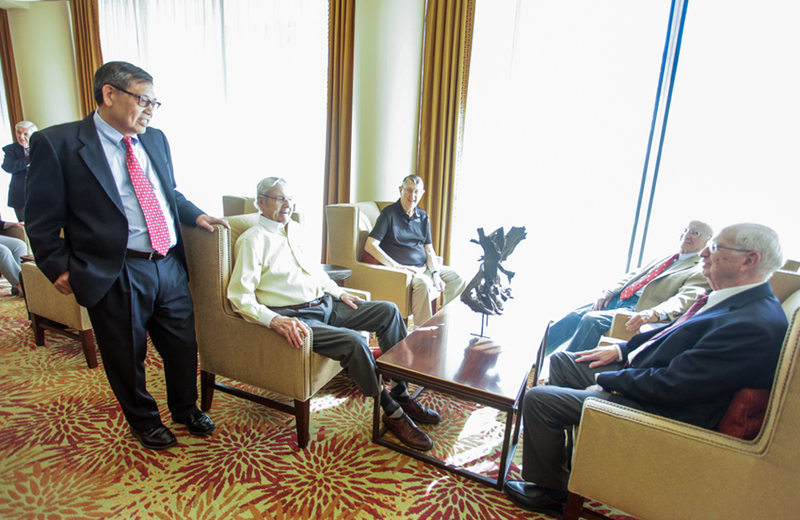 There are several university studies that have shown persons living in retirement communities live more active, social, healthy lives for longer. With our dedication to whole-person wellness, we provide an environment supportive of your physical, spiritual, intellectual and social needs. 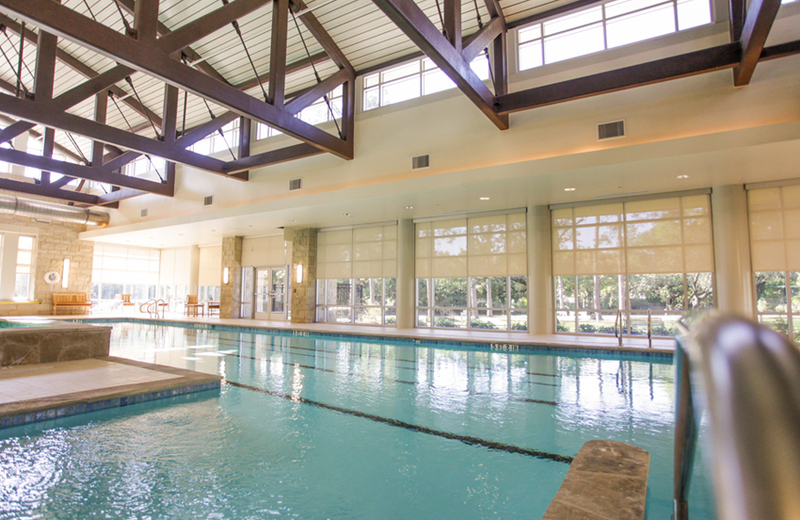 InPower supports these wellness initiatives with delicious and healthy meals, the pool and fitness center, walking trails, gardens, and a myriad of activities and opportunities for community involvement at your fingertips. Ask us how InPower can help you to live a long, meaningful, and healthy life. WHAT SHOULD I SAY TO MY FAMILY MEMBERS? The best way to communicate with family or loved ones about your decision is to be open and to provide them with all the information they need to be comfortable with your move. Invite them to join you for a visit to Brazos Towers at Bayou Manor where you may have a meal, meet our staff and – most importantly, talk directly with residents living here now. 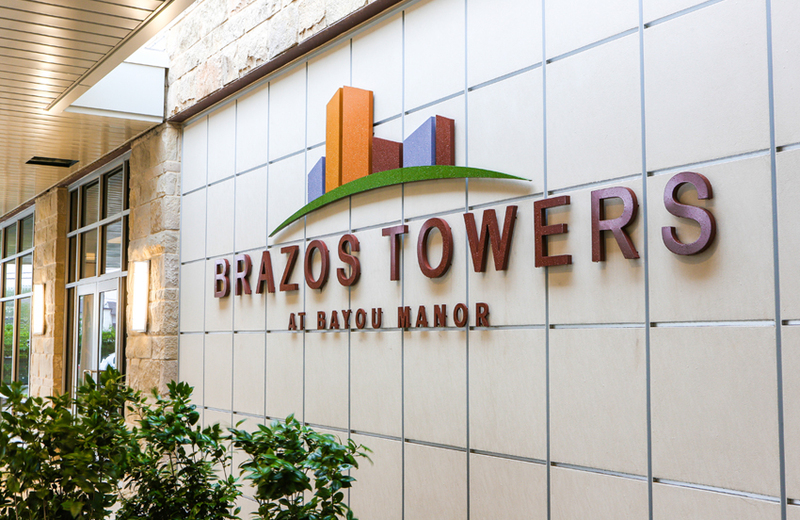 Brazos Towers at Bayou Manor will offer a great value to Residents. Take a few moments to complete this form to compare your typical monthly expenses with the exceptional value at Brazos Towers at Bayou Manor. WHY SHOULD YOU PAY AN ENTRANCE FEE VS. DOING JUST A MONTH TO MONTH RENTAL? As a 501(c)(3) Non-Profit organization Brazos Towers at Bayou Manor provides assistance to residents who, through no fault of their own, outlive their assets. Peace of mind knowing that if your health needs change you won’t have to move from the community where you chose to live. You simply make a change within the community and receive a higher level of care. Brazos Towers at Bayou Manor residents benefit from discounted rates for Assisted Living and Long Term Care in the Health Care Center compared to other health care related centers. Receive 30 days a year (per person) of complimentary care in our Health Care Center each year that you reside in Independent Living. Your retirement counselor can provide more information for you about the many care benefits available at Brazos Towers at Bayou Manor. Like many things in life – the process of finding a community that will be a good fit takes time. Everyone’s situation is different and people have different priorities. The longer one waits to make a plan the more urgent the decision becomes and the more options become limited. Online searching is a great place to start, but you need to visit the communities you are considering in person. You will understand the differences between a “facility” and a “community” simply by walking through their front doors. Brazos Towers at Bayou Manor understands that life transitions are big decisions, so we give you the information, tools and time you need to make an informed decision. If Brazos Towers at Bayou Manor does not meet your needs we are happy to help guide you in the right direction to finding the right place. As counselors we can share insights and knowledge from our years of experience that will help to streamline your search and help you to find your new home. With the assistance of our professional partners we help to guide you through the process one step at a time and in most cases the transition is complete within a few months. The key is to remain focused on the next step instead of the end goal – then it becomes less overwhelming. People who have an interest in Brazos Towers at Bayou Manor can receive our brochure in the mail or schedule a time to visit us in person. Then they can see and feel what makes us different. Both processes for reserving a unit and joining our waiting list (Future Residency Program) are simple, straightforward and relatively risk free. Giving our future residents the luxury of time to digest the information they’ve gathered, review it with those they love, and come to a conclusion that suits them and the vision they have of their future. HOW WILL A MOVE MAKE THEM FEEL MORE SECURE AND HAPPIER? One of the major benefits of living at Brazos Towers at Bayou Manor is a very simple one – the services, activity choices and opportunity for socialization are much more robust then they would ever have living alone. Just the knowledge that help is just an urgent call away, or looking forward to the next exercise class or lecture, creates a sense of security and well being. WILL THEY RECEIVE THE CARE THEY NEED? As a continuing care retirement community (CCRC) or Life Plan Community, Brazos Towers at Bayou Manor is fully equipped and licensed by the State of Texas to provide wellness services, assisted living, nursing, rehabilitative services and memory care support. 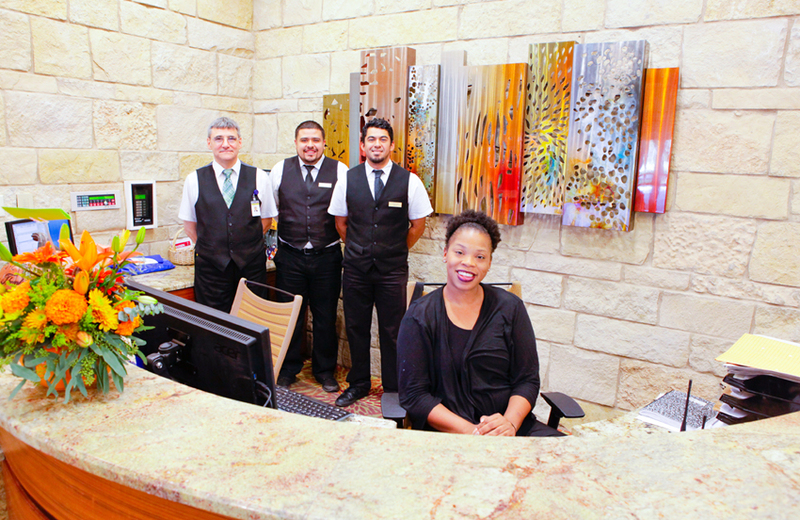 Our staff grows to care about your loved ones like family, and are always ready to provide respectful support. If a resident needs services beyond our scope (hospital care, psychiatric care), we will be sure they are referred to an alternative where their needs may be met. SHOULD I WORRY ABOUT WHAT MAY HAPPEN TO THEM LIVING ALONE? Because the parent makes the decision for themselves – it alleviates the uncertainties associated with a decision made by the adult child alone. Adult children of our residents tell us all the time that their parents decision to move Brazos Towers at Bayou Manor was the best gift their parents could have given them. Why?…they no longer have to worry about their parents’ well being living alone in their own home. This peace of mind is priceless. We tell our residents that the best gift they have given their family is that of peace of mind. Taking the worry out of your life is an important benefit of moving to Brazos Towers at Bayou Manor. It allows your loved one to make their own choices, live an independent, enriched retirement with the security of supportive services available if and when needed.